The Cañada Alamosa Project is a joint undertaking of the Cañada Alamosa Institute, Monticello, NM, and Human Systems Research of Las Cruces, NM. 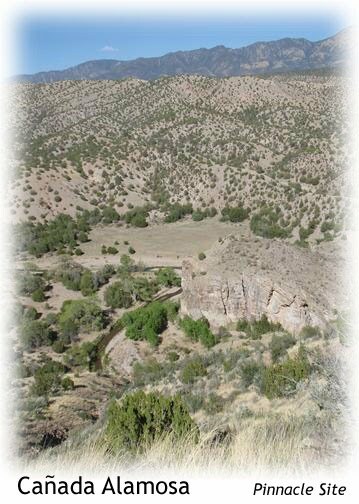 Its purpose is to study, understand, and relate the stories of the generations of people who lived along Alamosa Creek, a perennial stream flowing through Socorro and Sierra Counties to the Rio Grande in southwest New Mexico, during the past 2000 years. The entire Alamosa drainage—728 square miles of Chihuahuan high desert and forested uplands—is the research setting. Since 1999, under the leadership of Karl W. Laumbach, project archaeologist, excavations have been conducted at four major pithouse and pueblo sites in upper Cañada Alamosa (Monticello Canyon). They are the Victorio Site (pithouse and Tularosa Phase), Pinnacle Ruin (Magdalena Phase), the Kelly Canyon Site (Socorro Phase), and the Montoya Site (Mimbres Phase). In addition, over 40 other sites in the canyon have been surveyed and recorded. The 19th and 20th century history of the canyon and its people is being gathered through oral history interviews with descendants of the canyon’s Native American and European (Hispanic, Anglo, and others) settlers. Their stories form a link to that of the Warm Springs Apache (Chihenne), a Chiricahua Apache band whose homeland was centered at Ojo Calilente, headwaters of the Rio Alamosa, and to the Buffalo Soldiers who were posted at the Warm Springs Indian Agency in the 1870s. The efforts and support of many individuals and organizations have been essential to CAP’s accomplishments. They include students and archaeologists from the University of Colorado, Boulder, and Eastern New Mexico University, Portales; volunteers from Earthwatch Institute, Maynard, MA; staff of the New Mexico Farm and Ranch Heritage Museum, Las Cruces; and staff of the New Mexico Bureau of Geology and Mineral Resources, Socorro, and many other scholars, scientists, students, crew members, and neighbors.